No sooner had Google announced the Android 5.1 update, that the factory images for the new version started popping up for some Nexus devices. Notably absent, however, was Google's latest and greatest — the Nexus 6. If you're using this phone and you are impatient about getting the software update, you should be happy to know that the wait is almost over, hopefully. 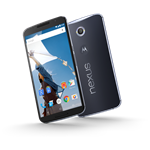 On its support pages for the Nexus 6, Sprint says that the Android 5.1 software update with build number LMY47D will be available today, March 11th 2015. Now the carrier has been wrong a few times before in regards to rollout dates, but it's usually more accurate than not, so you may want to start checking for updates on your phone and hoping that Sprint is right this time. And remember, since this is the Nexus 6 we're talking about, the update is supposed to rollout to all variants of the phone, regardless of carrier.